Lowdown: A small time American reporter comes of age through her assignment in battle torn Afghanistan. They say every good story revolves some sort of a journey. 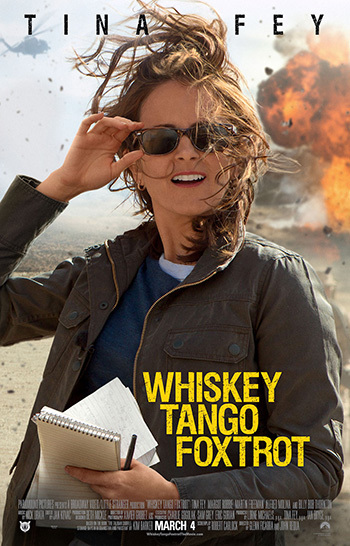 Well, in the case of Whiskey Tango Foxtrot (let's agree to stick with WTF from now on) our story is the story of an unlikely female journalist from the USA, who for some small time reason finds herself temporarily assigned to Afghanistan for war coverage duties. As with all things temporary, she finds herself stuck there for about a decade. Stuck is a bad word, because her journey has her advocating for the cause and actually wishing to stay there fore longer. The catch, I guess, is that this journey is based on the autobiography of a real person. The fact that person is a woman, and given the context of war and Burqa cladded Afghanistan, serve to explain why WTF got itself on film. A significant part of the story has to be personal journey of Tina Fey, the comedian who plays a serious role here and also acts as a producer. Clearly, this movie represents some coming of age for her as a person, too. Fey fares very well, thank you very much, demonstrating heroines have no problem leading a movie, thank you very much! The problem with WTF is that it doesn't take us places. Sure, there is Afghanistan, but it's not like I felt WTF expanded my horizons other than entertain me for the duration of the flick. Alfred Molina acting as a local weirdo warlord probably did the best job at entertaining me but it wasn't enough; nor were the talents of Martin Freeman and Margot Robbie. Overall: A win for women, but not a spectacular film in any distinguished way. 3 out of 5 crabs.